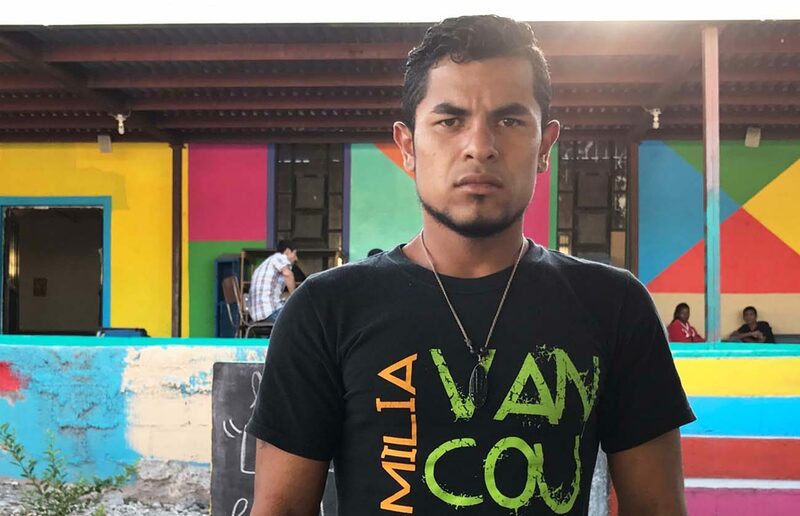 Migrants staying put in Mexico, abandoning efforts to reach U.S.
SALTILLO, Mexico (CNS) — Edelmiro Cardona hardly had any time to flee his native Honduras with his brother when gang members came calling. Cardona, who left behind a wife and 4-year-old daughter, explained how his brother had built a house and rented it, only to have gangsters, who were related to the tenant, move in and refuse to relinquish it. “We had to flee because they came by our house shooting,” said Cardona, who worked installing satellite TV service, but sold his motorcycle and tools to pay for his escape. The brothers made it as far north as Saltillo, some 190 miles from the Texas border. They decided to go no farther but to apply for asylum in Mexico. They are among a growing number of Central Americans deciding to stay in Mexico rather than try to reach the United States, the traditional destination for migrants streaming out of countries south of Mexico. Migration from Central America is nothing new as many have left in search of better economic opportunities, making Mexico — significantly wealthier than the Northern Triangle countries of El Salvador, Honduras and Guatemala — an afterthought as they passed through on their way to the U.S.
Nowadays, an increasing number of migrants are thinking about Mexico as a more appealing option because of U.S. restrictions on refugee resettlement. For the migrants, it’s more about finding somewhere safe. Mexico has been more a transit country for migrants than a destination, even though the nation has a history of welcoming asylum seekers. The most recent example occurred during the 1980s as civil wars forced thousands of people to flee Central America. The operators of Catholic-run migrant shelters, which operate throughout the country, along with the office of the U.N. High Commissioner for Refugees, say today’s trend stems from the dangers of the Northern Triangle countries. The homicide rate tops 80 per 100,000 residents in Honduras and El Salvador, some of the highest rates in the world. Powerful gangs extort payments from small-business owners or demand that children join their ranks, with teenage boys obliged to carry out killings and young girls being forced to become gangsters’ girlfriends. “There is a threat to entire families for rejecting (gang demands), so they leave. We are increasingly seeing entire families leave … including grandparents. They leave their countries due to persecution and enter (Mexico) as refugees,” said Mariana Echandi, UNHCR spokeswoman in Mexico. The path migrants ply through Mexico presents plenty of difficulties. Criminal groups regularly attack and kidnap migrants. In addition, a crackdown on Central Americans transiting the country has resulted in thousands of detentions and deportations by Mexican officials. Shelter operators report another factor: difficulties in crossing the U.S. border. Sister Leticia Gutierrez, director of the Scalabrini Mission for Migrants and Refugees, said no one crosses the U.S. border alone: They have to pay someone. Migrants “are seeking refugee status (in Mexico) because the United States is increasingly more difficult to reach,” said Father Alejandro Solalinde, founder of the Brothers on the Road shelter in the Isthmus of Tehuantepec region of Oaxaca state. Antonio Solis, 20, says he was attacked en route through Mexico and robbed of 380 pesos, the equivalent of less than $19. He knew the risk of the road, but fled after gangsters told him to carry out a contract killing. “They pulled me into a car and said, ‘You’re going to do this. If you don’t do this, we know where your family lives and you will be the last one to suffer,'” said Solis, who had worked as a field hand, but wants to stay in Mexico. Father Solalinde said his shelter encourages migrants to apply for refugee status. Those requests are increasingly being accepted, according to Mexican Commission for Refugee Assistance statistics. Asylum claims in 2016 increased by 156.4 percent from 2015, the commission reported. More than 2,560 successful asylum claims were made in 2016, an increase of 175 percent from 2015. The rate of acceptance moved from 46 percent in 2015 to 63 percent last year, while the number of abandoned claims has decreased. Shelter operators said migrants are being provided better information. Lawyers, provided by some shelters such as the one in Saltillo and advocacy organizations, are helping with more refugee claims. Still, the process is not always easy as cases can take up to four months to resolve. The commission operates only three offices throughout the country and people still do not know all of their legal rights or that they can seek asylum. Stay and fight to improve the conditions of your own country. There are over 7 billion people and perhaps half of the world faces trials and tribulations. No country should be asked to take them all. Instead, you should fight to have the kind of country you want, instead of coming to another land. As a Christian I feel for you and pray for you. As a Christian I also know that God does not expect the people of a nation to open the floodgates.